Each time I see this building, it is more and more dilapidated. 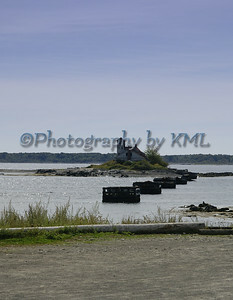 It stands on a little island in the harbor, and I believe it is the old Coast Guard Station. As long as I have seen it, those pilings leading out to it have been in this condition. The only way to get to it now is by boat, but I believe it is government owned land, so it is off-limits anyway. The roof was starting to give way the last season - I sure the past winter was rough on it. We will check it out again the next time we visit the ocean. One of these times I expect it will be there no more. There it stood beside the ocean's edge. A lone oak tree still dressed in it's autumn finery. Look real closely at the water's edge along the right side of the image. 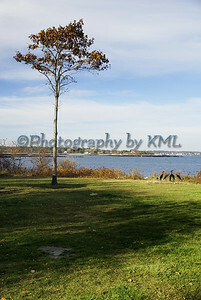 See that group of black birds? They are sculptures - placed there by the park owners. Straight and tall, this solitary tree has seen many seasons. But not as many as some of the older, much thicker oaks that are further down the path. 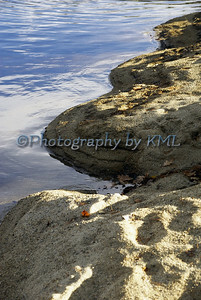 It's more like an abstract, this view of the lake's edge. The water reflected the blue of the cloud filled sky. The footprints in the sand created shadows and highlights of their own. This wavy edge of hills and valleys is now underwater. The water has now risen to it's summer level. Won't be long before we will be enjoying the refreshing coolness it always gives us. My new Sony DSLR A580 camera. The above photo is one I borrowed from the Sony site. She came just like that - body only - I didn't need the lenses as I already have them. How different it is from the A100. It takes 16mp images and it has an HD movie mode that I can't wait to try out. Since it has been raining for over a week, I could only take sample shots of things around the house as I got used to the workings of it. Yesterday had me chasing the cat around, but he wasn't too cooperative. My daughter and grandson will be visiting this evening - I'll chase him around for a while after I grab all the hugs and kisses I can get from him. Life is good all the way around! This post is for a friend who left a comment on my previous seagull post a couple of days ago. Kat, over at In My Dreams I can Fly, stated that perhaps the next time I saw him, he might put on a show. Well, we were lucky enough to catch him doing just that a couple of photo frames later. I refer to this one as the "yoga" shot. He was stretching his wing and one of his legs at the same time - while keeping excellent balance on just one leg. Now that was quite the "bird show"! It has been this way for over five days now, and it is supposed to last for another four. Rain, Rain, and more Rain. 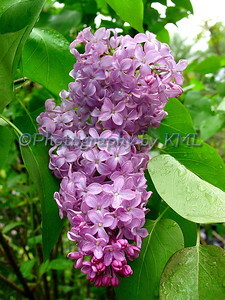 The purple lilacs in the front yard started blossoming last Friday. And I usually open the kitchen window and let their beautiful scent fill the house. It has been so cold we have been running the heat. No open windows. And the poor flowers are bent way over, drooping down. Their blooms will pass shortly, so my fingers are crossed for a couple of sunny days before they do. I have taken a couple of strolls outside in between the raindrops to grab a few whiffs. 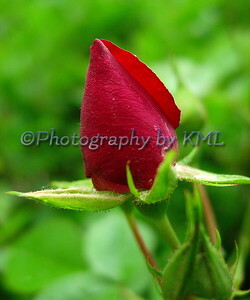 No perfume can smell any better than Mother Nature's own blends! He watched with a wary eye as we passed by - shifting from leg to leg but not taking flight. We walked to the end of the dock - it was very long, and he was towards the beginning. I kept my eye on him as we sat and took photos at that far end. I didn't expect him to stay there the whole time. But he did, and he posed ever so nicely on our return trip - the sun was at a much better direction heading this way. 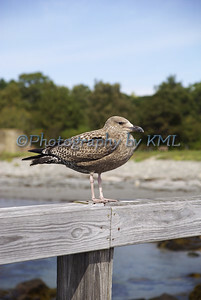 He is a young gull - his feathers are still brown and white. By next season he will sport the white and gray of his kind. I wonder if he will still be as friendly when he matures. Time spent searching and researching online. For the best prices and the best features from the best seller. I knew exactly which model I wanted - body only - I already have the lenses I need. There aren't many sold that way. But I ran across a deal, with a rebate, and I placed the order on Friday. I have been waiting anxiously all weekend for the shipping and tracking info - hopefully tomorrow that email will arrive. More details later - needless to say - I am so excited!! Milky quartz is the mineral that is in the surface of this large boulder. 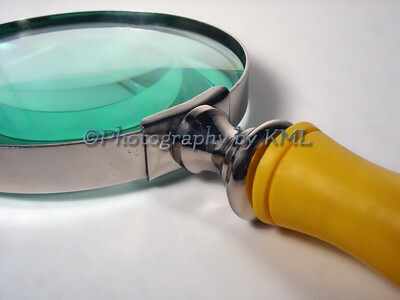 Most think of quartz as a clear crystal or a mass of smaller ones jutting out of a rock in a display. 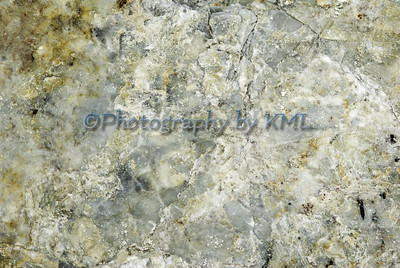 It is the second most abundant mineral on the earth, feldspar is the first. Several varieties of this mineral are semi-precious stones - the pretty purple amethyst is the most well known. When the Milky Quartz was formed, minute particles of gas and liquid were trapped when the crystal was forming, and they caused it to become cloudy. The quartz above was in a granite boulder. We have tons of them around here - after all, our state is known as "The Granite State" for a reason! We have been picking three times this season - yesterday was the last trip. These delicious treats of spring are only here for about a week. 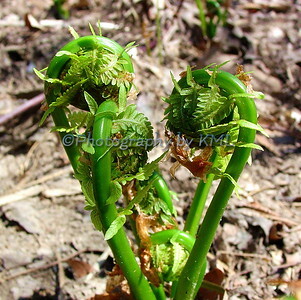 Then they become unfurled and are beautiful ferns for the rest of the year. Cleaning them is a big job - they must be rinsed until the water they are soaked in is clear. After four soakings and rinsed under running water, they are ready to be cooked. We spent the afternoon blanching and cooling them for the freezer. They will taste oh-so-good this winter when we pull them out for a meal! Hope it is a special one for each of you! I know it's spring, and photos of snow are not the most desired right now. But I finally finished processing a load of images from last month and this one was in it. 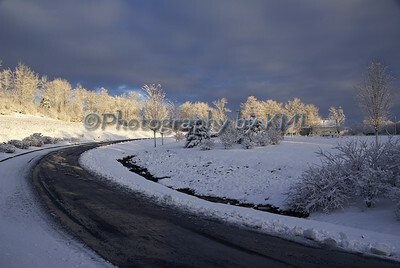 It was taken about 6:30 in the morning, right after a night of wet snow. This small view doesn't do the photo justice. It was just beautiful that morning - every branch on every tree was coated with snow. And when the rising sun lit it up, it just glowed. But it only lasted a few minutes - that sun warmed it all just enough that it fell off quickly. How lucky to be on the road that morning! Supper was very yummy last night. Shrimp Primavera was on the menu. 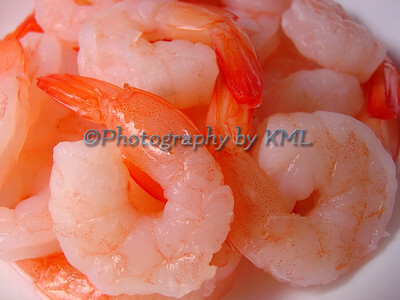 I love making this meal - it's full of fresh veggies and of course the shrimp. And the best part - it makes enough for at least another dinner and perhaps a lunch as well. Leftovers - they sure make life easy sometimes, and this is one of those dishes that taste better as it sits. The flavors blend together to make it even more delicious! 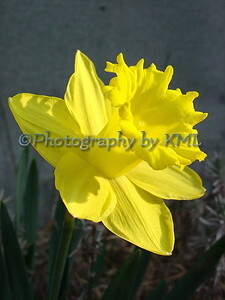 I love to walk by the garden and see the bright smiling faces of the daffodils. Mixed in among the red tulips, these daffodills dance and nod in the wind. Even when covered with raindrops, they still smile and brighten the day. A welcome sight these first flowers of spring - I just love them!